UK Disney Stores Getting Cool And Hard To Find Hasbro Figures! JTA UK reader Kam sends us a cool store report from Birmingham and it involves Hasbro stuff. Click through to see his report! Look at what JTA reader Pinbacker has come across. Click through for more. The Vinyl Collectible Dolls (VCD) line may be the single most underrated high-end collectibles line there is. Realistic or super-deformed, they all seem to possess an inordinate amount of charm. See how the reinvisioned Emperor's Royal Guard looks in our Research Droids Reviews today. Be sure to leave your own thoughts in our comments section, vote in the poll or even leave comments about it on our Facebook page. Click the banner below for the direct link to the review! As always, you can also send your own personal review requests via email if you'd like to see something that we didn't cover yet. Yet ANOTHER Source For A Decently Priced TBS 6-inch Stormtrooper! Are you still looking for The Black Series 6" Stormtrooper at brick and mortar for a decent price? JTA reader Mike_5555 has a suggestion for you. Click through for more. Did anyone see Judge Judy today by chance? Star Wars memorabilia collector Tristan Moriuchi was suing prop replica sculptor Zach Kinnard (who makes helmets and other costume items) for not returning his merchandise or refunding his money. Both are extensive Star Wars collectors. What's interesting however is that due to legal constraints (cough, cough Lucasfilm Ltd. likely) the Judge Judy show was UNABLE to show any of the Star Wars brand visually on live television, which clearly irritated Judge Judy. So she handled the case in a manner where she had the two litigants go outside the court room to resolve it by themselves. Did they come to an agreement? If you missed the episode, try and find it online because it was a riot. You Just Cannot Prepare For What You Will Find At Walmart Sometimes! JTA moderator flamingtoilet came across an unbelievable find: The Black Series 3.75" line. No! That's not it! Click through to find out the early Christmas miracle! UK Readers: Deluxe TBS Up For Pre-order At Forbidden Planet! Good Pricing! UK readers can now pre-order The Black Series Deluxe Jabba The Hutt and Speeder Bike With Biker Scout from Forbidden Planet. They're selling them for 35.99 pounds each. Check out Jabba The Hutt HERE and the Speeder Bike With Biker Scout HERE. Special thanks to UK reader theoriginalchrz for the news! You can tell from today's review that we will be returning to look at some of the great products released in the Vinyl Collectible Dolls (VCD) line. We will be checking out a few here and there. But some of you may not know about three of the realistically styled VCD figures, each of which bring a uniqueness and specialty to any one-sixth scale figures line. When I reviewed these figures years ago, I feel I didn't give them the attention that they needed or deserved. So I retook their respective photo galleries which doubled and quadrupled the amount of images in the reviews to help show you why these are essential figures for your collection if you collect Sideshow Collectibles current 1:6 Scale Figures line. Save for Yoda, these characters are not attempted that often in collectible format. But Medicom Toy produced some amazing minimally articulated figures of these characters and I believe they're worth it to check out again.... in much better detail this time around. The Vinyl Collectible Dolls (VCDs) line may be the single most underrated high-end collectibles line there is. See why we have an affinity for them, especially Boba Fett (The Empire Strikes Back Ver. ), in our Research Droids Reviews today. Be sure to leave your own thoughts in our comments section, vote in the poll or even leave comments about it on our Facebook page. Click the banner below for the direct link to the review! As always, you can also send your own personal review requests via email if you'd like to see something that we didn't cover yet. Jedi Temple Archives, with thanks to an astute reader, posted another source for our readers to obtain the SDCC exclusive Boba Fett and Han Solo in Carbonite figure set. The vendor was RobotKingdom.com. Cautious readers wanted to know more about this seller and rightfully so. Click through to see JTA reader Steve H.'s experience. We told you all at Toy Fair, now Hot Wheels comes clean and announces via their Twitter page that there is indeed a new relationship between Hot Wheels and Star Wars. Click through to read their Tweet and how you can find out more about it! It's almost time for two new lines from Hasbro to start up! We're gearing up by officially opening Visual Guides for both The Black Series [Phase II] and Star Wars: Rebels! Click below to visit each guide where we've listed both the confirmed and rumor lists of all upcoming figures! We'll update these guides as new information comes in over the next few months. So, there was definitely some hoopla created from the “cancellation” of the two TVC figures that were originally scheduled to be part of wave 5 of The Black Series. (I saw the release schedule with my own eyes. I should know.) AT-RT Driver and Republic Trooper (gasp!) have been axed from the latest confirmed assortments from JTA sponsor Dorkside Toys. But with some help from a close friend, we’ve come up with a solid answer that may explain this all. And no, it’s not the obvious [unannounced] revision case defense that has already been considered. This is more speculation, but we think it holds water. Click through for more. The Geonosian War Room (Featuring Nute Gunray, Passel Argente & Shu Mai) gives us three great figures to help pad our Separatists collections. See more in our Research Droids Reviews today. Be sure to leave your own thoughts in our comments section, vote in the poll or even leave comments about it on our Facebook page. Click the banner below for the direct link to the review! As always, you can also send your own personal review requests via email if you'd like to see something that we didn't cover yet. Welcome to our next Q and A of the Day post! This column will be published daily, weekly, monthly, or just based on how many questions I get emailed – but no more than one a day. Feel free to send in your questions and I will put them in the queue. Click through for Q and A of the Day: Day 64. Topic: Should I try to get the original Boba Fett Premium Format Figure, or should I wait for the new one? PPWtoys reached out to us to spread the word about their latest Potato Head releases: Hello fellow Star Wars enthusiasts! As an established vendor and manufacturer in the toy industry for almost 20 years, we would like to share our Star Wars collectible and iconic toys with your audience. This July-August, our Star Wars Potato Heads will be available to consumers. Click through to see this week's Big Bad Toy Store new arrivals and pre-orders. You can also get daily product news and updates by subscribing to BBTS's Facebook page and Twitter feed! New LEGO Sets Hit The UK, Including Star Wars: Rebels Sets! JTA reader Matt H. writes in to let UK readers know that the new LEGO sets are hitting, even the Star Wars: Rebels ones! Click through to see his report! Cantina Showdown? Jabba's Rancor Pit? Yup! New The Black Series Revealed! We told you at Toy Fair that SDCC would be "need new underwear" worthy. Our friends at Rebelscum are beginning to provide proof that this is indeed the case. Cantina Showdown? Jabba's Rancor Pit? Yup! Click through to read their report then come back here to talk about it! The Geonosian War Chamber (Featuring Poggle The Lesser, Count Dooku & San Hill) gives us three great figures to help pad our Separatists collections. See more in our Research Droids Reviews today. Be sure to leave your own thoughts in our comments section, vote in the poll or even leave comments about it on our Facebook page. Click the banner below for the direct link to the review! As always, you can also send your own personal review requests via email if you'd like to see something that we didn't cover yet. Welcome to our next Q and A of the Day post! This column will be published daily, weekly, monthly, or just based on how many questions I get emailed – but no more than one a day. Feel free to send in your questions and I will put them in the queue. Click through for Q and A of the Day: Day 63. Topic: Oh where, oh where could my A-wing Pilot be? In case you missed any, we have reviewed all four (4) Talking Star Wars Figures from the Disney Stores chains, complete with detailed commentary and a large photo gallery for each figure. See why you should not let these pass you by without a second glance. Petco's Star Wars Pet Fans Collection is expanding and we have a quick round-up of few of the new products, available now, to bring your pet to the bark side. Currently 30-50% off during the Memorial Day weekend, click through to see how much your pets will enjoy these amazing Star Wars accessories! Special guest contributor Rich Alot explains it all! Click through for more! Another surprise I found this weekend was the arrival of wave 2 of the pitifully scaled "micro" Class II vehicles in the Star Wars [Darth Vader/ROTS] line. These should have been available months ago, and were actually hitting at a few select retail locations, but now they're hitting a little bit harder. Click through for the proof. Darth Plagueis Approaching Peg-Warming Status? I am not sure WHO needs Darth Plagueis at this point, but he is ironically becoming a peg-warmer in my area. Maybe it was just the holiday weekend, but I found no less than 5 at various TARGET and TRU stores directly in the Philly area, a shocker for our area indeed. Click through for one instance of proof. Here is the final Talking Star Wars Figure for a while. See Talking Darth Vader and let us know what you think of it in our comments. It's the focus of our Research Droids Reviews today. Be sure to leave your own thoughts in our comments section, vote in the poll or even leave comments about it on our Facebook page. Click the banner below for the direct link to the review! As always, you can also send your own personal review requests via email if you'd like to see something that we didn't cover yet. Click through for the latest arrivals from Entertainment Earth: Plush, Vinyl, Steins and more! Check out the awesome R3-series astromech droid R3-D3 from the Star Tours sub-line in our Research Droids Reviews today. Be sure to leave your own thoughts in our comments section, vote in the poll or even leave comments about it on our Facebook page. Click the banner below for the direct link to the review! As always, you can also send your own personal review requests via email if you'd like to see something that we didn't cover yet. JTA wishes our readers a very Happy Memorial Day and to remind you to never take our freedom for granted. JTA sponsor Dorkside Toys writes in wit the latest announcements, pre-orders and clearance merchandise! Click through for more! JTA reader Arnold C. lets us know that new 2014 STAR TOURS sets are hitting eBay. These actually look pretty cool! UPDATE: Sorry folks. I didn't even know about these sets and assumed there were the new ones this year. These are actually a year old. My bad. With special thanks to JTA reader Master Cole for pointing this out, TARGET is running a decent LEGO sale through May 31st. Click through for more. The Black Series 6-inch Stormtrooper IN STOCK For $22.99! Hurry! The Black Series 6" Stormtrooper is IN STOCK again for $22.99 on Amazon right now! Special thanks to Michael W. for the alert! There is another.... R4-M9. But it's a totally different character. How is this possible? The Star Tours R4-M9 astromech droid is actually pretty cool. It's the focus of our Research Droids Reviews today. Be sure to leave your own thoughts in our comments section, vote in the poll or even leave comments about it on our Facebook page. Click the banner below for the direct link to the review! As always, you can also send your own personal review requests via email if you'd like to see something that we didn't cover yet. We're celebrating five solid years of Research Droids Reviews without missing a day! To celebrate this momentous occasion we not only released a mega-review today (our largest and most complex yet! ), but we have the Visual Guide to go along with it. Click below to take a look at the most comprehensive and complete look at the Disney Star Tours Droid Factory (2012 Collection). Happy Memorial Day from Brian's Toys! They have a sitewide 10% off coupon through June 6th.Use code MEMDAY. Check out the latest newsletter at Brian's Toys! A Message To You From Me: May The 24th Be With You! Please click through to read a special message from me to all the readers of Jedi Temple Archives. Loose Samples Of The Black Series 3.75-inch Wave 4 Hit eBay! Wow! Loose production samples of the next 3.75" wave of The Black Series line have hit eBay! Click any thumbnail below to be taken to the auctions where you can see larger full images of these figures. A few quick points: Bastila Shan and Dak Ralter are indeed repaints; Luke looks worse than you could possibly imagine – even worse than the carded samples we saw; Yoda looks much better than the carded samples we saw before. eBay seller viperskingdom is taking orders now and while we are confused on their exact availability, it looks like they will ship shortly. MAFEX Darth Vader Fully Revealed + Pricing Information! With special thanks to our friends at Yakface.com for the alert, Medicom Toy has revealed more details about their eagerly anticipated MAFEX Darth Vader figure. Surprisingly, the figure will retail for a fair $45! See more by clicking through. Dorkside Toys Reveals New Packaged Shots Of Deluxe The Black Series! JTA sponsor Dorkside Toys has posted new boxed images of The Black Series 6" Deluxe Jabba The Hutt and Biker Scout With Speeder Bike. Check them out! Our friends at Yakface.com have posted a new The Black Series case assortment rumor. While they urge you to take it as a rumor at this point, I can tell you that it is slightly alarming as Hasbro has changed the original case assortment (if the rumor is true) in a dramatic way in my opinion. I personally saw the release schedule from Hasbro at Toy Fair this year and it not only showed who was in each wave, but when they would be released. This new information is quite different. (You can see my original exclusive release schedule report HERE.) Now, this rumored case assortment list drops AT-RT Driver and Republic Trooper (the latter a very desperately needed repack). Check out their report and be sure to comment on the new potential controversy in our comments! Speak Like Yoda You Will! Check out a grammar and style guide to "Yodify" your language. Click through for more! This isn't déjà vu. We did actually just look at the Power Of The Jedi version of this vehicle. But the Star Wars "Saga" TIE Bomber is a complete repaint of the 2002 release. See how it differs with plenty of comparison images in our Research Droids Reviews today. Be sure to leave your own thoughts in our comments section, vote in the poll or even leave comments about it on our Facebook page. Click the banner below for the direct link to the review! As always, you can also send your own personal review requests via email if you'd like to see something that we didn't cover yet. I have a new additional gig! I am honored to have been asked by site admin Rich Alot to come aboard and help out with his brand new site called popcritica.com, an amazing pop culture smörgåsbord that offers insightful banter about the fun things in life. From movies to television, from toys to almost anything else, popcritica.com should definitely be one of your daily site stops. Don't worry, it's not another Star Wars related site (I couldn't be part of another Star Wars site anyway). It's everything else. In the near future you will see some other familiar names hopping on board to contribute as well. Check us out! Remember That JTA Helps You Find Stuff! JTA reader Plastic Empire from Canada shares a happy story of securing four The Black Series 6" Stormtroopers for his collection. Find out how he did it! (Clue: He benefited from a post on JTA and the news spread quickly!) Click through for more! Darth Plagueis Is STILL Out There! JTA reader Nicholas S. writes in to assuage everyone that Darth Plagueis is definitely "out there". Check out his harrowing tale of trying to secure this figure for his own collection! Edwards/Whitta Team Announced For Star Wars Standalone Films! In addition to the episodes of a new Star Wars trilogy, Lucasfilm and Disney have begun development on multiple stand-alone movies that will offer new stories beyond the core Saga. Gareth Edwards will direct the first stand-alone film, with a screenplay by Gary Whitta. The film is due out December 16, 2016. StarWars.com has the full story! Episode 14: Another week has passed and on this episode of The Realm Recap they discuss all the toy news revealed including Hasbro’s new 6" Yoda, speculation on a couple new unannounced LEGO sets, new Premium Format figures from Sideshow, the return of Star Tots, plus a quick rundown of some Episode VII and Star Wars Rebels news and more. Click on through to check out the latest episode and feel free to subscribe to their channel and leave suggestions on what you’d like to see covered on the show. Episode 15: Another week has passed and on this episode of The Realm Recap they discuss all the toy news revealed including Saga Legends, the return of the SDCC Boba Fett w/Carbonite Han, new preorders from Gentle Giant and Sideshow, plus Episode VII, Star Wars Weekends, Star Wars Rebels news and more! Click on through to check out the latest episode and feel free to subscribe to their channel and leave suggestions on what you’d like to see covered on the show. Our friends at Yakface.com have just published an incredible photonovel entitled The 6th Trial: Seekers Of The Dark Relic. Be sure to check it out! The Sideshow Collectibles Sixth Scale Wolfpack Clone Trooper is now available for pre-order! Click through to see the full gallery and place an order! Darth Plagueis Wave Hits Big Lots! If you're still in need of Darth Plagueis, try Big Lots. JTA reader Darth Chuck sends us proof that wave 3 of The Black Series line is now hitting these stores! Click through for the proof! Our friends at Rebelscum.com have received confirmation from Hasbro that Canadians will not be receiving wave 2 of the Saga Legends line which includes Clone Commander Cody, Captain Rex, Boba Fett and the Stormtrooper. This may explain why Canada is already receiving wave 3 (no chronic repacks cluttering shelves, or a breather from them at least). Because Hasbro has revisited the way they approach case assortments now, we hope that a Stormtrooper or Boba Fett repack will not be unlikely for the future. Hurry! The Black Series 6" Stormtrooper is IN STOCK again for $22.99 on Amazon right now! Special thanks to Stefan D. for the alert! UPDATE: Gone! But keep checking periodically. You never know when it will come back in stock! The Luke Skywalker (Snowspeeder Pilot) Mini Bust is absolutely gorgeous. Special thanks to JTA sponsor Entertainment Earth for providing us with this review sample. See why you need one in our Research Droids Reviews today. Be sure to leave your own thoughts in our comments section, vote in the poll or even leave comments about it on our Facebook page. Click the banner below for the direct link to the review! As always, you can also send your own personal review requests via email if you'd like to see something that we didn't cover yet. JJ Abrams Announces Fans Have A Chance To Be In Episode VII! Fans have a chance to be in Star Wars Episdoe VII!! Find out how by clicking through! The easiest way to make a "new" figure is with a simple repaint. See R2-D2 (Tatooine Mission) which is based on Episode IV with a sculpt of R2-D2 based on Episode I. It's a neat twist in our Research Droids Reviews today. Be sure to leave your own thoughts in our comments section, vote in the poll or even leave comments about it on our Facebook page. Click the banner below for the direct link to the review! As always, you can also send your own personal review requests via email if you'd like to see something that we didn't cover yet. Is MAFEX The New The Black Series? Medicom Toy revealed a new scale of Star Wars figures for their super-articulated MAFEX line. Always known for remarkable higher end collectibles, the first item in this line will be Darth Vader which is always a great choice. Between the expertly tailored cape and the dynamic proportions (and supposed very reasonable revisited MSRP – especially for what you're getting), do you think that this is a line that will compete strongly against Hasbro's The Black Series line as they're similar scales? Your thoughts are appreciated in our comments! This particular prototype looks to have a few issues, but if they're corrected, these may become the best Star Wars figures on the planet. Special thanks to flyguy.net for alerting the Star Wars community to this. JTA reader Les Dudis found some interesting foreign micro vehicles. Click through to see images and read his report! What's interesting is that they have been packaged in a similar style to the 2013/2014 line look. Could these be new? JTA reader Chris G. alerts us to another source to get your Boba Fett With Han Solo In Carbonite SDCC exclusive. TheToySource.com is the online retailer and they also offer free shipping on orders of $150 or more! Check it out! Take a look at the latest Big Bad Toy Store. You can also get daily product news and updates by subscribing to BBTS's Facebook page and Twitter feed! Original Trilogy In Unaltered Form + "Phase Out" Of Prequel Trilogy? BleedingCool.com has intercepted an email with a killer rumor inside of it: that the Star Wars Original Trilogy will be released in its original unaltered form. Take it with a grain of salt, but how unimaginably cool would this be? Plus, they note a less likely rumor: the potential phasing out of the Prequel Trilogy into LEGENDS. Your thoughts in our comments please! We are having a hard time attempting to understand those that cannot appreciate the Talking Star Wars Figures line from Disney. Luke Skywalker is just simply another hit for us. With a stunning paint job, great likeness and an ultra-cool removable helmet, he would only be perfected if he only came with his lightsaber. 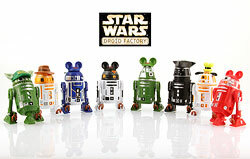 See this awesome Star Wars toy in our Research Droids Reviews today. Be sure to leave your own thoughts in our comments section, vote in the poll or even leave comments about it on our Facebook page. Click the banner below for the direct link to the review! As always, you can also send your own personal review requests via email if you'd like to see something that we didn't cover yet. The Vinylmation figures have hit DisneyStore.com! JTA reader Frank G. gives our readers two tips on how to maximize your savings on these figures. Click through for more! Stranger Than Fiction: Single Pieces Of TBS Hit TARGET? JTA reader and friend Darth Chuck sends us some interesting news about what his TARGET store is receiving as far a The Black Series is concerned. Click through for more. Star Wars Episode I: The Phantom Menace turns 15 years old today. Some despise the film, while others liken it to fine wine: with age it betters. Where do you stand in your assessment of the film? The very first premium one-sixth Sandtrooper was the Real Action Heroes version. It may appear slightly aged today, but see where it all started in our Research Droids Reviews today. Be sure to leave your own thoughts in our comments section, vote in the poll or even leave comments about it on our Facebook page. Click the banner below for the direct link to the review! As always, you can also send your own personal review requests via email if you'd like to see something that we didn't cover yet. JTA sponsor Dorkside Toys writes in with the latest announcements, pre-orders and clearance merchandise. Click through for more. Everyone is familair with the incredible B-1 Battle Droid buck Sideshow Collectibles created for their impressive 1:6 Scale Figures line. But now the variations are coming, including the stunning Security Battle Droids, which are tremendous repaints of the original figure. See why we love them in our Research Droids Reviews today. Be sure to leave your own thoughts in our comments section, vote in the poll or even leave comments about it on our Facebook page. Click the banner below for the direct link to the review! As always, you can also send your own personal review requests via email if you'd like to see something that we didn't cover yet. JTA reader and Facebook friend Gabriel G. let's us know that the third wave of The Black Series 6" line has hit Mexico. I am not so sure if everyone offering his/her side of the debate surrounding the new outlook of the Expanded Universe realizes the impact it has on.... well, Star Wars in general. Some aren't affected by the decision to freeze frame the rich history under one house and separate from the new canon. But I believe this decision has greater affects. While doing research for a big upcoming RDR, I was somewhat surprised shocked to see every page on Wookieepedia denoted with a LEGENDS banner now. In hindsight it makes sense that this was done, but it does make you do a double take when it's confirmed that this is no longer "true". It seems that what we knew to be true is now only true from a certain point of view. Maybe this argument has already been made ad nauseum at this point, but as we all come across "new" things that have been converted to LEGENDS, it may have an impact more like a wake-up call than "oh, yeah that makes sense." You already know we're big fans of the Disney Star Wars Talking Figures line. You saw an advanced look at the Talking Han Solo figure, but here is its official database entry post. See more in our Research Droids Reviews today. Be sure to leave your own thoughts in our comments section, vote in the poll or even leave comments about it on our Facebook page. Click the banner below for the direct link to the review! As always, you can also send your own personal review requests via email if you'd like to see something that we didn't cover yet. If you haven't seen it yet, click through to check it out! The Disney Star Wars Weekends promo Big Red Bow was such a hit on our Facebook page (nearly 100 shares and 2500 views) we thought we'd post it here for our non-Facebook using viewers! Click through to check it out! Pay particular attention to the background when the car with the bow pulls up (and the 1138 nod). Nice touch! See what color does for a plain white clone trooper. The 501st Legion Clone Trooper is an excellent one-sixth scale figure in the Real Action Heroes line. See why it is worth your time in our Research Droids Reviews today. Be sure to leave your own thoughts in our comments section, vote in the poll or even leave comments about it on our Facebook page. Click the banner below for the direct link to the review! As always, you can also send your own personal review requests via email if you'd like to see something that we didn't cover yet. Sideshow Collectibles reveals the Wolfpack 104th Battalion Clone Trooper! Check out the sneak peek reveal! Welcome to our next Q and A of the Day post! This column will be published daily, weekly, monthly, or just based on how many questions I get emailed – but no more than one a day. Feel free to send in your questions and I will put them in the queue. Click through for Q and A of the Day: Day 62. Topic: Is that intentional damage? Another new McQuarrie-based book is being released, this time a children's book. Star Wars: The Adventure of Luke Skywalker, Jedi Knight is illustrated using the artwork from Ralph McQuarrie to tell the story. You can read the full article here, and find it on Amazon.com here. This is due for release October 7, 2014. Thanks to JTA reader Michael for the heads up! Did you miss BBTS' supply of the SDCC exclusive The Black Series Boba Fett With Han Solo In Carbonite? Thanks to JTA reader Michael W., we may have another source for you and this time it's $59.90 at RobotKingdom.com. Before you get too excited, this online shop is in Hong Kong, but if you desperately need this piece for a good price, it may be worth your while to see if they ship to your area. Check it out! Endor Rebel Trooper Mini Bust Revealed! Gentle Giant Ltd. announces another cool collectible based on Return Of The Jedi: The Rebel Endor Trooper Mini Bust. Hasbro alerted us that things will be shifting towrds Episode VI the closer we get to Episode VII. It looks like that is indeed happpening across the board now! Jumbo Vintage Biker Scout Announced! Gentle Giant Ltd. announces the latest Jumbo Vintage Kenner Figure: the Biker Scout! Yes! Another character from ROTJ! Yawn! Another white Clone Trooper. How boring! Actually, Medicom Toy created a nice base figure in the Real Action Heroes line.... and it was reused multiple times to make better figures! Learn more in our Research Droids Reviews today. Be sure to leave your own thoughts in our comments section, vote in the poll or even leave comments about it on our Facebook page. Click the banner below for the direct link to the review! As always, you can also send your own personal review requests via email if you'd like to see something that we didn't cover yet. Found! Latest Class II Vehicles Hitting Toys R Us! If you recall, by some stroke of luck I found the 2014 SW [DV/ROTS] Boba Fett's Slave I (TESB version) Class II vehicle at my local Toys R Us store back in January (which I believe was a freak occurance). Now JTA reader Ryan G. can confirm that these cases are finally starting to arrive in a CA TRU store. Click through for his report! After much thought on how to incorporate the new Canon Universe into our Novel Timeline Guide, we decided to put the new novels in the same timeline to make things easier for everyone to find. Instead of separating the timelines we have kept them together and labeled each book accordingly (Legends or Canon). This way, readers can choose to follow the overall timeline for any books they want to keep in their own personal timeline. Stop by and check out the latest Canon additions to the timeline! If you have not had a chance to check out the Star Wars Celebration VII web site, the site is now fully operational. Get all the info you need to make your plans! HasbroToyShop.com is taking pre-orders on the new Mission Series two-packs with a June delivery date. Check out what they're offering. Don't Give eBay Scalpers Your Money - Give It To BBTS Instead! Do you still need the SDCC exclusive The Black Series 6" Boba Fett with Han Solo In Carbonite? JTA sponsor Big Bad Toy Store has them up for pre-order at "Half Price" for a late May delivery. While still more than what was charged at SDCC, this is the cheapest we have seen them available online! DOn't forget to tell them JTA sent you! Check it out! Happy 70th Birthday George Lucas! Happy Birthday to the Maker! We turn our attention back to some Medicom Toy Real Action Heroes again. Not perfect but still great, the Clone Trooper Captain (Attack Of The Clones Ver.) is a nice clean version of this particular member from the Army of the Republic. Check it out in our Research Droids Reviews today. Be sure to leave your own thoughts in our comments section, vote in the poll or even leave comments about it on our Facebook page. Click the banner below for the direct link to the review! As always, you can also send your own personal review requests via email if you'd like to see something that we didn't cover yet. And there is another.... early look at an upcoming RDR. I just received the Security Battle Droids two-pack today and I generated the gallery and finished up the Collector Notes. Review is coming soon. But check out everything else now! I Have Totally Had It! Why You Need The Disney Stores Talking Han Solo Figure Too! Jedi Temple Archives provided you with the very first unboxing and full review of the Disney Stores Talking Stormtrooper. Now we're also providing you with the first unboxing and full review of the Disney Stores Talking Han Solo figure! See why you'll want this figure too! It's an early look at an upcoming RDR! Big Bad Toy Store has released their latest newsletter. Click through to see what's new. You can also get daily product news and updates by subscribing to BBTS's Facebook page and Twitter feed! An incredible release by Hasbro when collectors were considered their main audience first was the Jabba's Palace Court Denizens (Jabba's Palace) Ultra set. In it were two creatures and one droid which help round out any Jabba's palace diorama. With excellent sculpts and cool features, see why this is a must-have in your collection. We will probably never get anything like this again, especially for this price. It's all in our Research Droids Reviews today. Be sure to leave your own thoughts in our comments section, vote in the poll or even leave comments about it on our Facebook page. Click the banner below for the direct link to the review! As always, you can also send your own personal review requests via email if you'd like to see something that we didn't cover yet. JTA reader Michael M. wrote an article that we shared with our readers about the status of his Star Wars room. Well, he has finally fixed it up the way he wanted. Click through to check out the cool progress report! It took until 2004 for Hasbro to update the escape pod originally released in the vintage Kenner era. C-3PO With Escape Pod (Tatooine Escape) is an excellent release with a clever reuse of an older figure. See more in our Research Droids Reviews today. Be sure to leave your own thoughts in our comments section, vote in the poll or even leave comments about it on our Facebook page. Click the banner below for the direct link to the review! As always, you can also send your own personal review requests via email if you'd like to see something that we didn't cover yet. New Star Wars: Rebels Information Leaked? Apparently a lot of accidental information slipped out about Star Wars: Rebels recently and StarWars.com worked overtime on the "damage control". We don't know all of the details, but site The Outhousers was on alert and has culled all of that spoiling information on their site. Click through if you want to know about more characters, some plot and how many episodes there will be and more! Yes! JTA sponsor Dorkside Toys is NOW taking pre-orders for The Black Series 6" Deluxe Jabba The Hutt and Biker Scout (with Speeder Bike). Check these out and more by clicking through!! Would you believe that Disney's Talking Stormtrooper is one of the greatest Star Wars kids' toys we have come across in probably the last decade? It's so good that Disney may be the best "licensee" to make all future kids' products. This should free up time for Hasbro so they can focus on making good Star Wars toys for collectors and just plain good stuff in general. Trust us, there is no way they're making something remotely this good in their own line especially at this low price. See why we adore the Talking Star Wars Figures line from Disney. You're going to love them too! It's all in our Research Droids Reviews today. Be sure to leave your own thoughts in our comments section, vote in the poll or even leave comments about it on our Facebook page. Click the banner below for the direct link to the review! As always, you can also send your own personal review requests via email if you'd like to see something that we didn't cover yet. Welcome to our next Q and A of the Day post! This column will be published daily, weekly, monthly, or just based on how many questions I get emailed – but no more than one a day. Feel free to send in your questions and I will put them in the queue. Click through for Q and A of the Day: Day 61. Topic: Why doesn't Hasbro reuse more sculpts than they do? A couple of readers have written in asking us to address all of the eBay scalping of The Black Series 6" Jabba The Hutt set. There isn't much we can say. It appears as if these "sellers" are annual offenders. Yes. It's outrageous what the scourge of the earth is doing to collectors. It's worse that Hasbro doesn't kill them dead in their tracks by making these easy to obtain for all that want them. There are always two positions on these issue. The attendees should have something exclusive for attending. Not sure if I personally agree with that, but that's the way it is. I loathe SDCC exclusives. I wish they would all be banned. But I don't rule the world. I should point out that we are just as bad if we panic about securing these exclusives and support the scalpers. While it doesn't help for StarWars.com to link to an article with the author essentially encouraging scalping (which has since been heavily revised), we just have to accept that we will go through something similar every year. Just don't buy these things on eBay for elevated prices. Because you are supporting why these folks can charge the money they do for these exclusives. While many of us are suffering a terrible drought collecting Star Wars toys, it's nice to hear reports of readers finding wellsprings of joy. Look what JTA reader Jonathan S. managed to secure for his collection. Not all of them are steals, but not bad for some of the highly sought after figures! Click through for more. JTA reader Derek advises fellow readers to check the girly aisles for cool Star Wars collectibles. You never klnow what you might find there! Click through for more. If you're still in need of some cool The Black Series 6" figures, then check your local Barnes & Nobles stores. JTA reader Frank has an update for us! Click through for more. There is another great LEGO promotion happening for our UK readers of the Daily Mail! JTA reader Chris sends us a cool thing hapening with this publication! Check it out! It's another Real Action Heroes figure review today! The Shock Trooper isn't exactly perfect, but it has is charm. And it was slightly difficult to acquire too! See how it rates in our Research Droids Reviews today. Be sure to leave your own thoughts in our comments section, vote in the poll or even leave comments about it on our Facebook page. Click the banner below for the direct link to the review! As always, you can also send your own personal review requests via email if you'd like to see something that we didn't cover yet. Eonline is reporting that Carrie Fisher has lost 40 pounds for the newly announced Episode VII Princess Leia role. Mom Debbie Reynolds confirms that her daughter looks fantastic. Check out the full story HERE. The Entertainment Earth Week Long Sale ends tomorrow. If you haven't checked out what they have to offer now is your last chance. Our brothers and sisters in the Force, JediNews.co.uk are hosting the latest Caravan of the Force. It's an incredible live auction for some pretty impressive Star Wars items. Click through for images and the complete PRESS RELEASE. Let's look at another cool Real Action Heroes figure today. The Stormtrooper was excellent for its time, and it's aged quite well nearly a decade later. See how it rates in our Research Droids Reviews today. Be sure to leave your own thoughts in our comments section, vote in the poll or even leave comments about it on our Facebook page. Click the banner below for the direct link to the review! As always, you can also send your own personal review requests via email if you'd like to see something that we didn't cover yet. Another week has passed and it’s time for a look back at the latest news in Star Wars collecting. On this episode of The Realm Recap they discuss all the toy news revealed including new Star Wars Rebels product and the SDCC Exclusive Jabba from Hasbro, the wallet/marriage killing product from Sideshow, plus they talk a bit about the cast reveal for Episode VII, teaser trailer for Rebels and more! Click on through to check out the latest episode and feel free to subscribe to their channel and leave suggestions on what you’d like to see covered on the show. Episode 52: Are We Collectors or Hoarders? Star Wars Storyboards: The Original Trilogy is set to release on May 13th. The latest release from J.W. Rinzler showcases the complete storyboards from the making of the Original Trilogy. Rinzler also brought us the awesome The Making Of series of Original Trilogy books (highly recommended!). Star Wars Themed Hot Wheels Confirmed! We told you they were coming back in February. But non-Star Wars sites claimed that our report was just old news and that they were just the previously announced "animated style" Cars-themed in Star Wars "costumes". Nope. We were right. JTA sponsors BBTS and EE are now taking pre-orders for REAL Star Wars themed Hot Wheels. We take yet another break from the Power Of The Jedi line to focus on some other various other collectibles. Today we start off by checking out the beautiful Medicom Toys Real Action Heroes TIE-Fighter Pilot (Black 3 "Backstabber") figure, which has been provided to us by Sideshow Collectibles, in our Research Droids Reviews today. Be sure to leave your own thoughts in our comments section, vote in the poll or even leave comments about it on our Facebook page. Click the banner below for the direct link to the review! As always, you can also send your own personal review requests via email if you'd like to see something that we didn't cover yet. Looking for 6" scale accessories for The Black Series 6" scaled line? JTA reader Arnold C. alerts us to a source where you can start building some cool diorama scenes. Click through for more! Many collectors thought Aurra Sing should have been released as one of the first figures in the Episode I line, but she came two years later. Premium articulation was wasted on her, but she has a decent likeness. See more in our Research Droids Reviews today. Be sure to leave your own thoughts in our comments section, vote in the poll or even leave comments about it on our Facebook page. Click the banner below for the direct link to the review! As always, you can also send your own personal review requests via email if you'd like to see something that we didn't cover yet. UPDATE: The Black Series 6" Yoda IS NOT An SDCC Exclusive! That was lightning fast! We have our answer regarding Yoda already! Justin from HunterPR confirms that the article at ScreenCrush.com contains erroneous information. The good news is that The Black Series 6" Yoda is a main line release. Phew! Let The Controversy Begin: TBS 6" Yoda A San Diego Comic Con Exclusive? Here is an interesting tidbit of information. StarWars.com is linking to reputable site ScreenCrush.com to an article they posted about Hasbro's SDCC 2014 exclusive(s). They lump the newly revealed The Black Series 6" Yoda in the mix with Jabba The Hutt. Does a remote possibility exist that Yoda is a San Diego exclusive too? Or are their facts just messed up? Interesting to say the least. They write "As is the case with Comic-Con exclusive releases like this, the Yoda and Jabba figures will only be available at this year’s convention and will probably fetch a pretty penny on eBay when all is said and done." Those are pretty clear words, but what's your take? UPDATE: There is no need to worry. Yoda is a main line release. And as of 10:51 EDT Screen Crush has corrected the bad information in their article; well, some of it. It's still littered with erroneous "facts" and still indirectly applauds scalping. Only true collector fans should be writing these types of articles. JTA sponsor Dorkside Toys writes in with their latest announcements! Check it all out! Yours truly attended the Disney Store event in Langhorne, PA on May the Fourth, but hair-brained me forgot to take pictures. Thankfully, JTA reader Chris C. was gracious enough to send me some of his snapshots. I made the line just in time at 96, but Chris got at his store a little bit earlier than I did. Click through for some event images! For those of you not close to a Disney Store, keep in mind that most of the store exclusives released thus far are in stock at DisneyStore.com. Special thanks to JTA reader Stefan for the alert! Obi-Wontons? Gungan Gazpacho? JTA reader and hard-hitting commenter Les Dudis had an extra special Star Wars day thanks to a very loving girlfriend. She made Star Wars themed food complete with action figures to accompany the dishes! Click through to see these works of art at The Busy Spatula! Even More Tuesday Morning TVC Finds! We are continuing to get store reports on awesome Tuesday Morning finds. JTA reader Mike S. sends us the latest there. Click through for more. R2-D2 (Naboo Escape) is a very good action figure, but it is very limiting. See what we mean in our Research Droids Reviews today. Be sure to leave your own thoughts in our comments section, vote in the poll or even leave comments about it on our Facebook page. Click the banner below for the direct link to the review! As always, you can also send your own personal review requests via email if you'd like to see something that we didn't cover yet. New Visual Guides And Research Droids Reviews Categories Created! We are gearing up our Visual Guides and RDRs for the new product coming this Summer/Fall. We have created two new categories: "Rebels" and "The Black Series [Phase II]". Keep in mind that ANY product that gets released under these respective line looks will go into these categories. (For example, Mission Series and Saga Legends will be packaged in the Star Wars: Rebels line look). Who do you hope to see from these lines? And what do you think about the line looks?Are they up to snuff? Let us know! With special thanks to HunterPR for forwarding high-resolution images, we can get a better look at Salacious B. Crumb's articulation. Click through for more. Brian's Toys customers can save $15 OFF today through May 18th whenever they spend over $75. Use coupon code 4THBWU at checkout to receive the discount. For more information, visit this week's newsletter at Brian's Toys. Be sure to check out their Vintage Loose Star Wars figure section as hundreds of new figures have been added, plus a new pre-order for the Sideshow Sixth Scale Jango Fett. We look at Sabé again, but this time she is called Queen Amidala (Royal Decoy). It is another excellent figure in the Power Of The Jedi line. See her in our Research Droids Reviews today. Be sure to leave your own thoughts in our comments section, vote in the poll or even leave comments about it on our Facebook page. Click the banner below for the direct link to the review! As always, you can also send your own personal review requests via email if you'd like to see something that we didn't cover yet. Instagram Reveals The Black Series 6-inch Yoda! Instagram reveals The Black Series 6" Yoda. It's cool, but what's up with that candy cane snake?! Anovos Luke Skywalker (Bespin Fatigues) Costume 25% Off! Anovos has put their very first costume up for pre-order, in addition to a fabulous 25% off discount (Tier 1 pricing). Click through for more! Action Figures In Action, May the 4th edition! Join us each month as JTA has teamed up with Calum Jones to bring you a monthly look at some of the best in action action figure photography on the internet! Enjoy a hand-picked selection from Calum's body of work to show off, in high resolution, what happens when you combine creative photography skill with digital artistry. The results will blow you away! We will be spotlighting some of the many samples featured on Calum's highly popular Instagram page, along with several monthly exclusive photos that will only be available right here on JTA! UK Disney Store Free Star Wars Figure Offer! We have been alerted by multiple readers from the UK of a cool Disney Store promotion there. Click through for full details! Special thanks to Chipsta00 for the alert! Two Huge Sales At Entertainment Earth To Celebrate Star Wars Day! There will be many deals to be had today, but it will be worth your time to stop by and check out not one, but two big sales going on at Entertainment Earth! May the 4th Daily Deal: In stock Star Wars Action Figures will be discounted up to 40% all day! Yes, this includes Star Wars Black Series! May the 4th Be With You Week Long Sale: All in stock Star Wars Statues and Busts will be 20% off! Sale goes from May 4 through May 10! May the Fourth Be With You At Amazon.com! Amazon.com is celebrating Star Wars Day with a great selection of collectibles from all areas! Make sure to stop by there today and see what they have in their Star Wars store! We enjoyed a sneak peek of the upcoming R2-D2 Sixth Scale figure last week, but now the full reveal is here... and it is amazing! They left no stone unturned to bring us all the accessories we could imagine from R2-D2 as seen in the Original Trilogy! Browse through the gallery and prepare to be amazed! One of the images shows a silhouetted C-3PO in the background... could the gold diety be finally coming soon? Next up for the Sideshow Collectibles May the 4th reveal is another Premium Format Figure: Boba Fett (version 2). Another reveal featuring only concept art, this is the second version of the popular bounty hunter to get the Premium Format treatment. Check out the sneak peak right here! Here's hoping this is the The Empire Strikes Back version, even though the concept art still shows the red gauntlet. Sideshow Collectibles has started their final reveals for their May the 4th celebration! First up is a brand new Darth Vader Premium Format Figure! The preview features concept art only. Click right here to check it out! We continue our look at characters from The Phantom Menace and it's time for Sabé (Queen's Decoy), another excellent figure in the Power Of The Jedi line. It's in our Research Droids Reviews today. Be sure to leave your own thoughts in our comments section, vote in the poll or even leave comments about it on our Facebook page. Click the banner below for the direct link to the review! As always, you can also send your own personal review requests via email if you'd like to see something that we didn't cover yet. UPDATE: Jedi Temple Archives' May The Fourth Contest! IT'S A WRAP! It's our May the Fourth contest! We need you to help Jocasta Nu find the missing holocrons! Jedi Temple Archives and affiliate Order Sixty-Six Toys are sponsoring a contest for our readers and the prizes include a The Black Series 3.75” 41st Elite Corps Clone Trooper (the "corrected European exclusive" version) – courtesy of Order Sixty-Six Toys and The Black Series 6” Stormtrooper – courtesy of Jedi Temple Archives. The rules are easy and we hope that the contest is fun for you. Click through for rules and directions! $22.99 TBS Stormtrooper - AGAIN! Hurry! The Black Series 6" Stormtrooper is IN STOCK again for $22.99 on Amazon right now! Special thanks to Jesse A. for the alert! May The Fourth Contest Begins Tonight! All JTA readers can get an advanced start on the contest at 9 PM EDT tonight. (Just saying....) Be here! Sideshow Collectibles announces their May 3 reveal: Life-Size Yoda Figure. Perfect for your living room corner table! What are you waiting for? Click here to view and order it! Celebrate May the 4th Be With You at the world's largest Star Wars store with a special $15 OFF orders over $75 coupon code! Visit brianstoys.com and use coupon code 4THBWU at checkout. Today marks 15 years since Toys R Us stores held their Midnight Madness event to sell the Episode I product line of toys based on the film. While we're not starting our Episode I reviews just yet, we will however be acknowledging the film by focusing on the Episode I action figures released in the Power Of The Jedi line. We start off with Queen Amidala (Theed Invasion), a figure that will never need an update in our opinion. It may not be flawless, but it borders very closely to perfect as far as we're concerned. See it in our Research Droids Reviews today. Be sure to leave your own thoughts in our comments section, vote in the poll or even leave comments about it on our Facebook page. Click the banner below for the direct link to the review! As always, you can also send your own personal review requests via email if you'd like to see something that we didn't cover yet. Entertainment Weekly (??) gets the exclusive reveal of the San Diego Comic Con Jabba The Hutt The Black Series 6" figure set. No dais. Click through for more. Episode I Toys R Us Midnight Madness: 15 Years Ago Tonight! JTA reader Frank C. provides additional proof of more great things showing up at Tuesday Morning stores. Click through for his report. Quick Pics: Disney Store Talking Darth Vader Loose! JTA reader Keith J. graciously sends us multiple quick pics of the Disney Store exclusive 13.5" Talking Darth Vader next. If you haven't seen it from head to toe out of the box yet, then click through. We have been tipped off that JTA sponsor Entertainment Earth will be having two incredible online specials, one of which will be for both scales in The Black Series line. (It's a significant discount folks! That's all we can say.) It's all happening/beginning on May the Fourth, but click through now to start making up your wish lists now. Our friends at Rebelscum have put together a great May the Fourth guide for readers. Be sure to have your checklists organized. It's going to be a big year this year! Cllick through for their compiled list. A TON Of Star Wars: Rebels Hasbro Figures Revealed! Wow! Our friends at Sandtroopers.com have revealed a nice chunk of the Star Wars: Rebels lineup! Check out there report and be sure to click through to discuss it all here!. Sideshow Collectibles Announces Sixth Scale Jango Fett! Sideshow Collectibles announces their next Sixth Scale figure in their May the 4th celebration: Jango Fett! Click through to check out this long-awaited addition to their sixth scale collection. The Black Series Mara Jade is currently on Amazon for $10.99. Click through to snag this if you are still needing it! There's only a handful available at this time. Thanks to JTA reader Clint for the heads up! It's not perfect, but R2-Q5 (Imperial Astromech Droid) is still a cool droid nonetheless. Made more popular in 2012 thanks to Return Of The Jedi deleted scenes, see the original action figure in our Research Droids Reviews today. Be sure to leave your own thoughts in our comments section, vote in the poll or even leave comments about it on our Facebook page. Click the banner below for the direct link to the review! As always, you can also send your own personal review requests via email if you'd like to see something that we didn't cover yet. UPDATE! They're Back Up For $22.99! Hurry! The Black Series 6" Stormtrooper is IN STOCK for $22.99 on Amazon right now! Special thanks to Jesse A. and David B. for the alert! Quick Pics: Disney Store Talking Stormtrooper Loose! JTA reader Keith J. graciously sends us multiple quick pics of the Disney Store exclusive 13.5" Talking Stormtrooper. If you haven't seen it from head to toe out of the box yet, then click through. Cheap Stormtroopers STILL Arriving At Toys R Us, But Not For Much Longer! We are still getting multiple reports from happy JTA readers finding The Black Series 6" Stormtrooper for a mere $13.99 at TRU brick and mortar stores (and even a few online reports). If you still haven't found this great figure, ask your local store when their trucks arrive and GET THERE as the sale ends soon!!! See Aarren A. 's successful transaction proof by clicking through. WOW! Hot The Vintage Collection Figures Hit Tuesday Morning! Holy *beep*! (We will let our friends at BanthaSkull.com finish that sentence!) Would you believe that AWESOME TVC figures are hitting Tuesday Morning now? Click through to see what can be found. Our own moderator Jeremy M. sends us a heartwarming report! Hurry! Grab The Black Series Stormtrooper for $22.99 On Amazon! Sideshow Collectibles kicks off their May the 4th celebration in a big way: by introducing a Life-Size Boba Fett! Once you place your order for this you can happily place it along side your awesome Life-Size Han in Carbonite (you ordered that, right!?). Seriously folks, who is ordering these!? They are amazing, but not for the average collector. As promised, it's May, so we return looking at the Power Of The Jedi line! 13 years ago to almost the day, the Star Wars Fan Club began shipping out the highly anticipated Carbon-Freezing Chamber from the Power Of The Jedi line to collectors. It really didn't meet our full expectations, but it may be the only chance you'll have to buy a playset based on the scene in The Empire Strikes Back. Likely an unused leftover from the POTF2 era, see why it has its moments. Learn more in our Research Droids Reviews today. Be sure to leave your own thoughts in our comments section, vote in the poll or even leave comments about it on our Facebook page. Click the banner below for the direct link to the review! As always, you can also send your own personal review requests via email if you'd like to see something that we didn't cover yet.